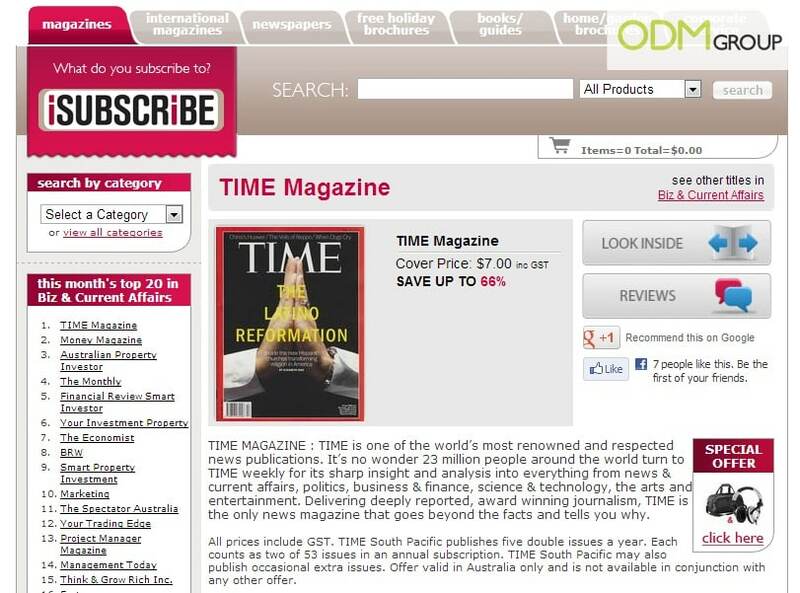 TIME magazine in Australia are running a unique gift with subscription set to attract new readers. Offering a combined gift of overnight bag & headphones makes this the perfect promo for those heading off for a weekend away. Subscription of 6 months allows low commitment period to trial out the magazine. TIME is one of the most renowned and respected news publications internationally. It’s no wonder millions of people from across the globe turn to TIME weekly for its sharp insight and analysis. Its content covers a huge spectrum from news to entertainment, finance to the arts. Delivering deeply reported, award winning journalism, TIME is the only news magazine that goes beyond the facts and tells you why. Subscribers are able to benefit from TIME All Access which includes print magazine, iPad edition and subscriber-only content on TIME.com, including the 20th century archive. It also entitles them to exclusive savings or a free gift. And finally special issues, this includes double and celebrated issues such as TIME 100 and the highly acclaimed Person of the Year. How will this gift with subscription benefit you? Having such a large surface area would allow your brand to be made extremely visible on the bag. By doing so, this will increase your brand awareness and till definitely boost sales for your company. This gift with subscription is a product that we all use on a daily basis. This marketing gift is a basic necessity and something that we need to use as we go about our daily routine. This way your brand would be seen in the train, at the gym and on the streets. Similarly for headphones, it is used on a daily basis. With that it would be increase your brands visibility and enhance brand awareness as well. This gift with subscription holds special features such as, padded ear cushion with secure fitting design for noise reduction, adjustable lightweight headband for long-wearing comfort and Space saving design with collapsible rotating ear-cups. The Frequency response is 20 – 20000Hz and Maximum input power is 2000mW. The cable extends to approximately 4M. Lastly the stereo plug is 3.5mm and it also includes 6.3mm adaptor. Other organisations or companies have used these products as promotional items as well. Do check out these blogs that were written in the past on marketing campaigns by Kelloggs, Actimel, Jolly Shandy and Sony. Check out some more Covermounts from around the world.